Entries should be submitted as QuickTime files rather than DVD movies. They can be burned on DVD-R media or Thumb Drives. You can download a Film Fest entry form here. The deadline for submission is July 31st. Lights! Camera! Action! It's Film Fest Time Again! 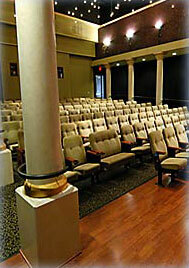 If you have been to one of our previous Film Fests at Rossmoor's luxurious Peacock Room, you already know it is a match for the finest private theater around, with lush soft seats, a grand screen, and a high-quality sound system. At the Fest, you will get to view some of the excellent short presentations made by members of the Diablo Valley Mac User Groups, The Rossmoor Camera Club and the Rossmoor Computer Club. The Film Fest is a short video/slideshow competition so entries are limited to eight minutes in length. Any topic suitable for a general audience is welcome. The winning entry will be chosen by a vote of the audience. Additional awards will be presented for editing and photography. Immediately following the Film Fest screenings, come to a wine-and-cheese awards ceremony held in the adjacent Fireside Room. Even if it's broiling outside, you can enjoy the Fest and awards ceremony in air-conditioned comfort. Meet your friends, have a glass of wine, and savor the gourmet cheeses personally selected by our DVMUG Food SIG Leaders. So friends, wake up the pets, line up the kids and grandkids, head out to your garden or take a photo/video vacation in Switzerland. Do whatever it takes to create a winning video or slideshow for our 2019 Film Fest. Even if you just come to see the films, you will be in for a treat! The Film Fest kicks off at 7pm on Tuesday, August 20th at the Peacock Theater in Rossmoor. Admission is free.